HA. And I thought I could play hooky and just enjoy a nice, easy wine without reviewing it, while working on my current deadline. NOT A CHANCE. This wine is just plain stinkin’ delicious! Fruity and flavorful, yet dry, with apple, bergamot, whiffs of a delicate and excellent French perfume, and some Five Spice. Dangerously drinkable. If you don’t like “champagne” I recommend that you try this one. For me, it was a game changer. LABEL: Sparkling Wine. Champenoise Method. 100% Torrontés. Pale yellow color with greenish hues. Citrus and delicate floral aromas are highlighted. Presents small bubbles that provide freshness. The palate is balanced with a pleasant acidity which highlights its varietal origin. This entry was posted in Argentina, Sparkling, Torrontes. Bookmark the permalink. 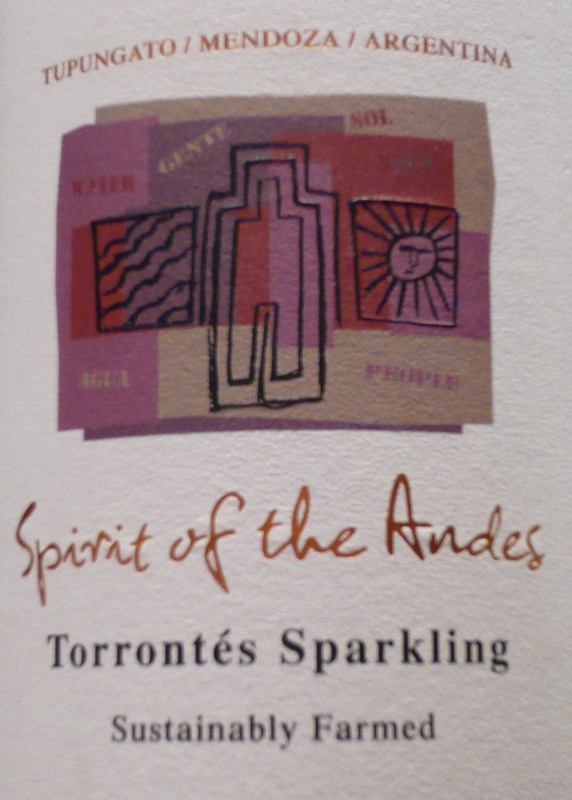 2 Responses to HIGHLY RECOMMENDED: Spirit of the Andes, Torrontés Sparkling, Tupungato/Mendoza, Argentina. 13.8% ABV, $14.99 and up. Can this wine be purchased in South Carolina? Hi, Linda, check out http://www.wine-searcher.com — it’s imported by http://www.VinDelSol.com and your local wine shop would probably be able to order it for you if they don’t already carry it. Our local distributor is http://www.GlobalWinesfl.com and they have a South Carolina branch, too.